This short video clip, filmed in 1948 in Arnhem Land, Northern Territory, Australia, shows a few of the steps of building a bark canoe and a bit of paddling what appears to be a different canoe at the conclusion of a successful sea turtle hunt. The bark was stripped in a rectangular section, not the ovoid or lozenge-shaped sections as were used for the canoes of the Murray Valley and as seen in the image at the bottom of this post. The bark appears to be charred on the inside of the hull. This might have been done to make it more flexible, to harden it, or to drive out insects and/or moisture and prevent rot. The bark is folded roughly in half and held upright by stakes driven into the ground, which define the width of the hull. The ends are stitched closed with what we presume is vegetable fiber. The stitching is on an angle for a bit of bow or stern overhang. The bark is cut back to a line several inches outboard of the stitches after they are in place. A "thwart" is tapped into place to open the bark envelope to the desired width and keep it from closing up. There are gunwale timbers of round poles (seen briefly at 0:24) that stiffen the sides but do not extend to the ends of the boat. We assume they are stitched/tied to the top edges of the bark, but can't make out that detail. Abaft the thwart (assuming that we're looking toward the bow), a withy is tied between the opposite gunwales, apparently to keep the bark from opening too wide (which we assume could occur as it softens when wet). The ends are caulked with a liberal application of tree sap, probably mixed with some hardening agent like ash or charcoal. 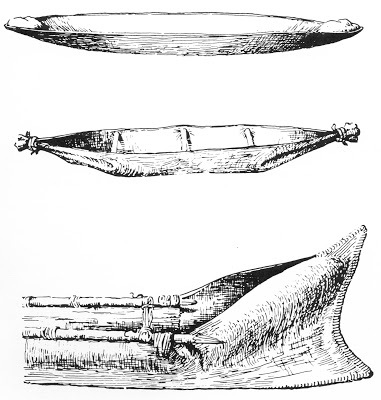 The canoe shown in use appears to have a different bow shape than one under construction. 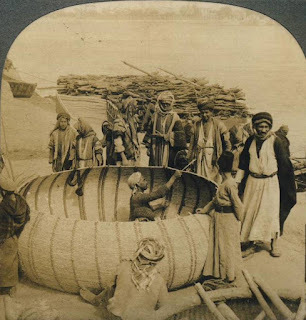 The stem is vertical; there are no gunwale timbers; and the visible thwart is shaped flat, not like the unshaped round stick as appears in the construction segment. In spite of the lack of gunwale timbers, the boat is well-shaped and apparently stiff, handily carrying its crew of four. Paddlers #1 and #4 have full-length paddles; crewman #2 paddles mainly with his hands but briefly uses a very short paddle or perhaps some other available implement; crewman #3 paddles with both hands only. We've written previously about canoes in Arnhem Land as they appear in the movie Ten Canoes. The construction method shown there appears to be the same, but the bow shape is different. In Ten Canoes, the craft have a ram bow or reverse overhang that may have been useful in parting the tall grass in the swamps where they were used. 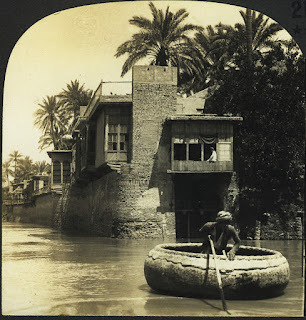 In contrast, the canoes in the present video were used at sea, where an overhanging bow would serve to ride up on waves and keep the interior dry, and a straight stem would at least not tend to shovel water into the boat. 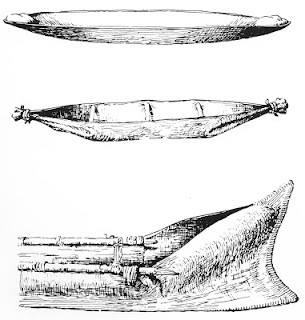 Gunwale timbers similar to those shown in this video appear in other Australian bark canoes, like the one shown at the bottom of the image below. The shape of the bow in this example, however, is quite different from either of the boats shown in the present video. 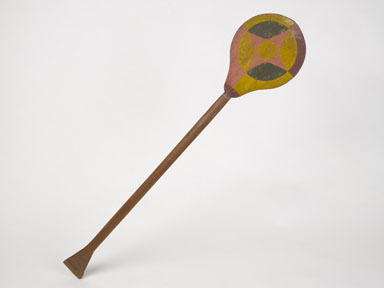 This wonderful paddle, in the collections of the American Museum of Natural History, is from the Beni River, a tributary of the Amazon. It was collected prior to 1909 by a surveyor for a South American railroad. The museum's description of the object is sparse, and even the exact location of its origin is ambiguous. The image listing says "Bolivia?," but old collection notes (see pages 311-312) say that it came from "the Beni." Rio Beni is entirely within Bolivia, although it flows into Brazil after joining other major rivers and changing names. The reason for the question mark, therefore, is unclear. Although the museum's documentation does not say, one assumes the paddle was used with a dugout canoe. It was collected "by native boatmen," whom the surveyor evidently employed in his work. 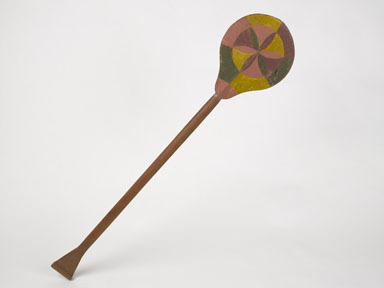 The paddle's appeal lies in its geometric purity. The blade is very nearly round, which is strongly emphasized by the painted designs on both sides. The shaft is untapered -- a perfect cylinder. And the grip is a simple triangle (apparently with a rolled top). The design on the obverse of the blade divides the area into three concentric circles, the outer two of which are divided into quadrants. The reverse is two concentric circles divided into six wedges. The same four colors are used on both sides. A bit of asymmetry in the arrangement of the colors on both sides breaks up what might otherwise be a too-rigid geometry. Thanks to Cate Monroe for pointing us to this item. 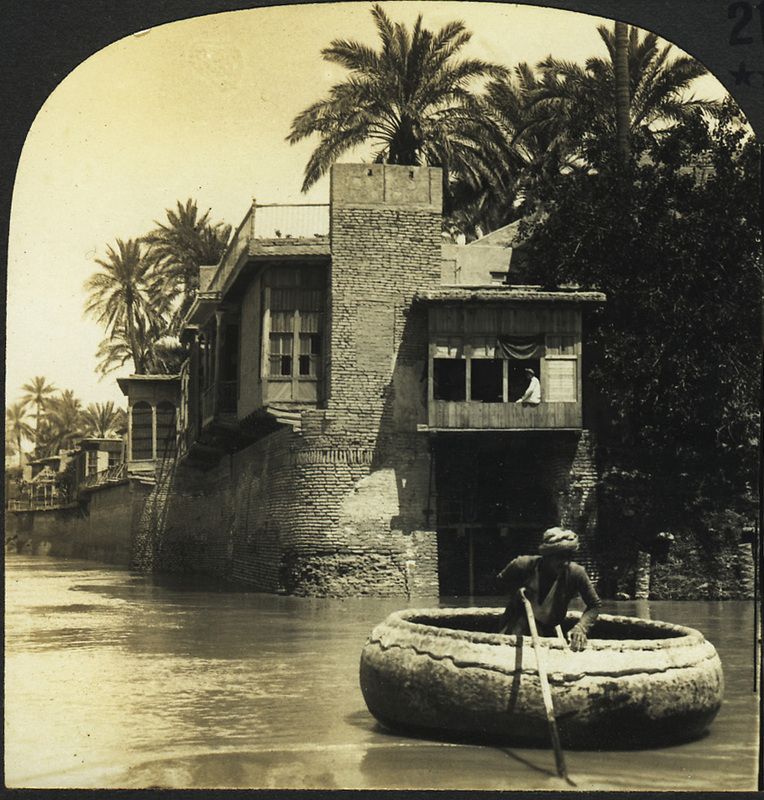 In response to our recent post on the Mesopotamian quffa, Harvey Golden sent us these scans of old stereoscope photos in his possession. (Harvey is the founder of the Lincoln Street Kayak and Canoe Museum in Portland, Oregon, and author of Kayaks of Alaska and Kayaks of Greenland, which we'll be reviewing soon.) We present them with thanks and brief comments. Two men were required to work on a quffa, one inside and one outside, to pass the stitches through to bind the coils of basketry together. Note the multiplicity of very light frames, arranged radially throughout the interior. The stitches that hold the coils of rushes together appear to enclose the frames as well.